← 418 "Any Given Sundance"
"Homer, if you're watching this, either I'm dead, or you've gone through my stuff. If I'm dead, this is my video will; if not, please keep away from my stuff." "Mona Leaves-a" is the nineteenth episode of season 19. Its original airdate was May 11, 2008. 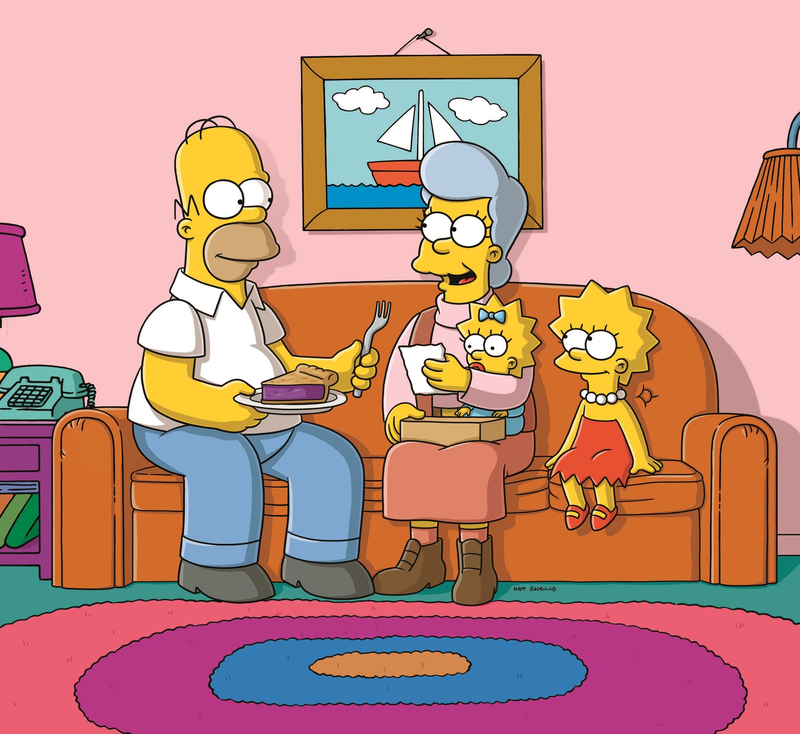 The episode features a return appearance by Glenn Close as Homer's mother Mona Simpson. "Homer is reunited with his mother, Mona, but isn't willing to forgive her for all the times she left him as a child. When she dies, a guilt-ridden Homer attempts to make it up to her by fulfilling her final wishes." After going to the Itchy & Scratchy's sweaters store at the Springfield Mall, The Simpsons find Stuff-N-Hug is in a malfunctioning state due to Ralph overfilling his teddy bear. Bart makes things worse by recording himself insulting Homer on a stuffed hippopotamus. They return home to discover that someone has broken into their home. Homer prepares to confront the burglar using a device made from a concrete block on a chain, but when he smells apple pie, he abandons the attempt and rushes into the house. Here he finds that the housebreaker is, in fact, his mother. Mona informs Homer that she intends to give up her life on the run and settle down with the family permanently, but Homer refuses, having been hurt too many times by her in the past. Bart and Lisa inform Mona that despite his anger, Homer loves her and misses her while she is away. After hearing this, Mona realizes that in an attempt to save the world, she had destroyed her family, and is truly remorseful. However, when she tries to tell this to Homer, he becomes infuriated. Sadly, she leaves the room, saying that she understands it'll take time for him to forgive her. Later that night, Homer feels guilty for the way he treated his mother, and decides to make her a card to express his feelings. He comes downstairs to give it to her, but finds her still and quiet in front of the fire. Unaware of the reason for his mother not speaking to him when she seemed so eager to apologize earlier, Homer gets directly into her face. Soon he realizes that his mother has died, and is devastated. After Mona is cremated, the family returns from her funeral and finds a DVD with her will recorded on it. She has left Bart a pocketknife. She has left Marge with a bag made of hemp. She has left Lisa her rebellious spirit (although Lisa takes her earrings anyway). She has left Maggie a soft toy made by the man at her first birthday. And she has left Homer with a difficult task. Homer must carry Mona's ashes to the top of a mountain, located in Springfield Monument Park, and release them into the air at 3 o'clock. Homer does this and the ashes float into a missile launching device in a secret lair inside of the mountain and cause it to malfunction. Homer, realizing that this was just another radical activist movement, feels betrayed. He accidentally falls into the secret lair. The secret lair is run by no other than Mr. Burns, who plans to send all of the leftover nuclear waste to the Amazon Rainforest to have it out of the way. Mona's ashes are removed from the missile launching system, and the plan proceeds as before. As punishment for trying to stop the missile launching, Homer is tied to a chair and trapped in Burns's lair. Outside of the secret lair, the family tries to break Homer out. Bart gives Homer Mona's pocketknife by throwing it into a vent that leads into the secret lair, although not without the knife making contact with his head. Outside, Marge ignites the purse made of hemp with Lisa's help involving one of Mona's earrings (she nicked them from her nightstand as she wanted a useful gift due to Bart getting a pocketknife), the smoke causes some guards that are guarding the lair to get high and Homer knocks them out. Homer takes out the remaining guards using the concrete block on a chain from the beginning of the episode. After praising the block, he sets it down on the (mostly wrecked) launch guidance console, although he inadvertently activates a 10-second timer for the self-destruct mechanism, which he managed to escape via parachute. He finally makes peace with his mother and releases her ashes in the air. He fondly remembers her, and Paul Simon's "Mother and Child Reunion" accompanies a tribute to her at the end. The episode was written by Joel H. Cohen and directed by Mike B. Anderson and Ralph Sosa. Glenn Close makes her third appearance as Mona Simpson, and Lance Armstrong has a cameo as himself. The episode is dedicated to the memories of Elsie Castellaneta (Dan Castellaneta's mother) and Dora K. Warren (Harry Shearer's mother). Also, this episode marked the start of yearly episodes to deal with women or mothers while airing on Mother's Day. "Mona Leaves-a" was watched by 6.02 million households and earned a 2.9 Nielsen rating. IGN and TV Squad called it a "decent episode", but hated Mona's brief appearance. Both, however, praised the scene where Homer found out Mona had passed away, and the tribute at the end. FireFox.org quotes the third act should not even have existed and that the James Bond theme had already been done in "You Only Move Twice", and ruined the image of the episode. Modified on July 16, 2017, at 01:59.